Digital strategy can be a frustrating field for many out there, especially small businesses that have limited time to dedicate to such a fast-changing form. One of the ways around this that I use on daily basis is using my life as a case study in what consumers are doing and what they want. What do I use? Where do I get my information, How and When? How do I want to discover places, ideas, sites, and the like. The one item the rises to the top, in the case of me is mobile. This weekend, the wife and I were headed out, with vague plans but needed to know more, so she pulled up the Denver Art Museum on her iPhone browser to get more info. The site took forever to load and was really hard to see (read: not optimized for mobile) . 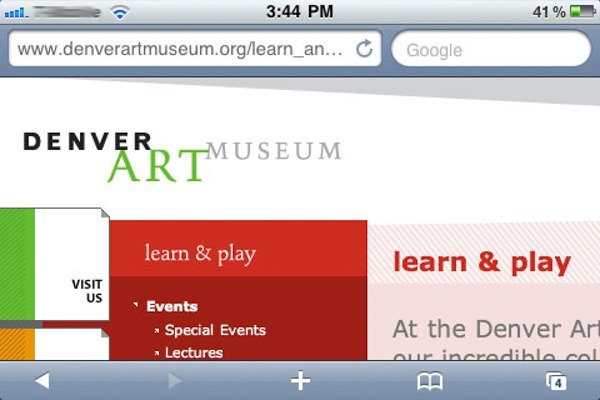 She turned to me and asked why a large institution like the Denver Art Museum didn’t have a mobile site. Now, I would not call my wife an early adopter of any sort; she’s rocking a iPhone 3g and it’s just fine for her needs, but as a consumer in the digital age she expected there to be information in a format she uses on a daily basis. I couldn’t tell why not, because it’s a no-brainer to me. You don’t have to have an app but you do have to have a site that takes into account mobile viewing. According to Digital Buzz there are over one BILLION smartphone (about one in four mobile phones) in the world now and by 2014 mobile internet usage should overtake desktop internet usage. In addition one half of local searches take place on mobile devices. How many times has this happened to me , I thought. If I am on the bus, walking down the street and need to look something up, I want a site that will be responsive to my situation. Does it have location aware? Maybe less so, but it should at least know that I am looking at it on a 3 inch screen. So, as you wander through your day with your family and friends, watch how they interact with technology and how the find their information. we all have our favorites, but as the smartphone becomes ubiquitous in this day and age, your business needs to come along with it. For small businesses if your thinking of re doing your website soon I would recommend looking at a WordPress themes (or a similar CMS system) that automatically notices (responsive action it’s sometimes called) when a mobile browser is looking at it and adjusts its display the information in a way that makes sense to the user. As for the art museum that day, we never went. It took us 10 minutes to browse their site for the content we were looking for on our phones, and by the end we just had better things to do. A missed opportunity perhaps but a learning experience for the rest of us.